The Denver Broncos will place starting right guard Ronald Leary on injured reserve per 9News’ Mike Klis. Leary had been Denver’s best offensive lineman this season before missing the last two games with a back injury. 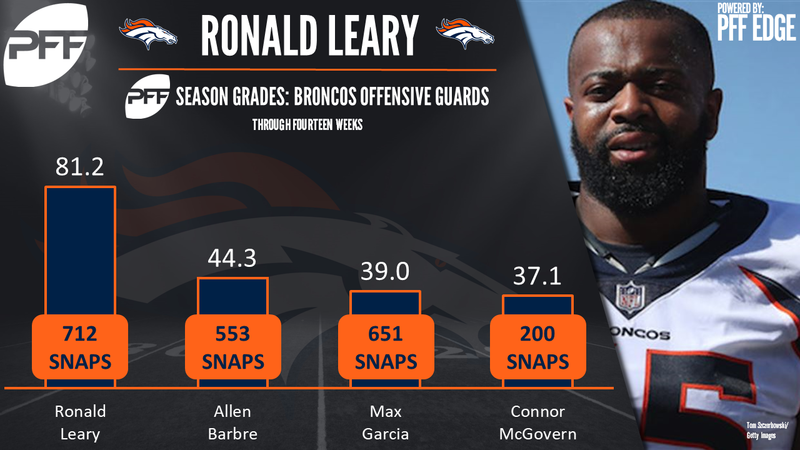 Leary has performed well as a free-agent acquisition for the Broncos, achieving a grade of 81.2 which ranks 11th among 77 qualifying guards through 14 weeks. He is one of only two Broncos offensive linemen (along with Matt Paradis) to have posted a grade of above 70.0 so far in 2017. Leary has been strong in pass protection, not allowing a single sack until Week 12 against the Raiders (his final game of the season). In fact, he didn’t allow a single pressure of any kind through the first four weeks of the season, and ranked first among guards with a pass blocking efficiency score of 99.1 before suffering a bicep injury against the Chiefs in Week 8. Despite playing through nagging injuries since, his pass blocking efficiency score for the season of 97.4 remains among the top-15 players at his position. Denver’s 2016 fifth-round pick Connor McGovern will continue to start at right guard in Leary’s absence. McGovern has struggled in the last two games, earning game grades of 31.3 and 35.9 against the Dolphins and Jets, respectively. McGovern was the 98th ranked guard in the nation in 2015, posting a grade of 73.0 for the Missouri Tigers.